Ever So Juliet | Edinburgh lifestyle blog: WIN AN ARRAN AROMATICS GIFT SET! I haven't had a giveaway for AGES, so here's a nice Christmas treat for you! 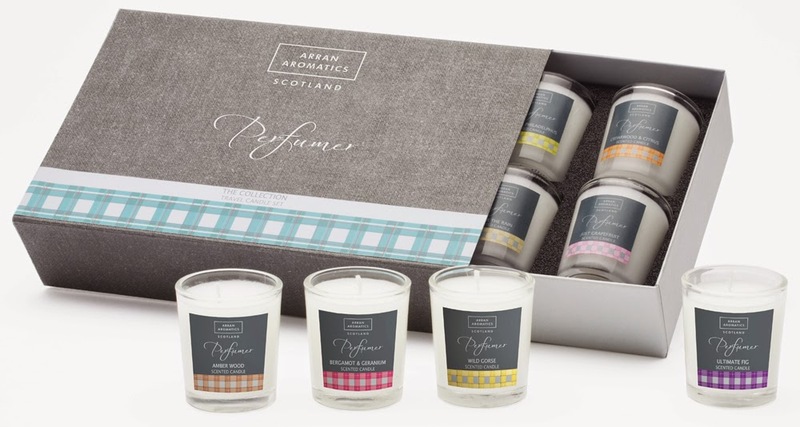 Arran Aromatics are a Scottish beauty brand (based, unsurprisingly, on the very lovely Isle of Arran), who make luxury candles, bath and body products infused with original fragrances inspired by the landscape and scents of the island. They are good guys too - all of their products are cruelty-free and they are dedicated to caring for the environment and being super enthusiastic about recycling. I am currently obsessed with candles (as soon as I turned 28 I suddenly understood why people spend a fortune on nice candles), so I've picked one of their candle Christmas gift sets to give away. The Perfumer Collection is a super cute set, inspired by their travels and fragrances from around the world, all infused with the essence of Arran. In the limited edition gift box you'll receive: Wild Gorse, Ultimate Fig, Just Grapefruit, Jasmine & Philadelphus, Amber Wood, Cedarwood & Citrus, Bergamot & Geranium, and After the Rain. The competition ends on December 3rd and is only open to UK readers. I'll email the lucky winner to get their details. Good luck! Is this giveaway open outside the UK? These are really lovely (and I have fond memories of a few visits to Arran!) but I'm in the US. WIN AN ARRAN AROMATICS GIFT SET!